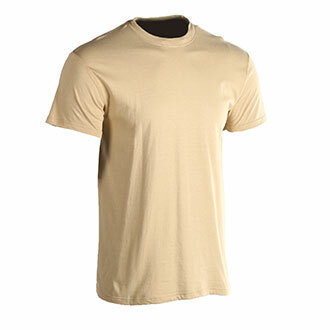 Built to the high standards demanded by law enforcement, military and fire professionals, 5.11 Utili T-Shirts can be worn in all types of conditions both on and off duty. High quality, 100% ringspun cotton construction with double-needle tailoring at the shoulder. Utili T-Shirts have a no roll, high-density collar that won't sag or fray. Longer than most crew neck T-Shirts, this garment remains tucked in no matter what the activity, to keep you looking professional at all times. Can be worn under ballistic vests, as a casual shirt or used for everyday under uniform wear. Packaged in a convenient set of three. These shirts are very good and preform to the standards stated. The shirt is never drenched from sweat, the collar is nice and tight and it fits well under my duty shirt. HOWEVER it is important you order a size bigger, otherwise when washed the shirt will shrink and will not stay tucked in to your duty pants like you want. Nice soft cotton feel. They get a little damp but not uncomfortably so. I prefer them to the high tech fabrics. They seem to hold color well, hold up to repeated washings, and are a good fit. Although these shirts seem to be of fine quality, there is absolutely NO moisture-wicking going on. I get home after a tour of duty, and I am soaked to the bone under my vest AND t-shirt. I thought these were a good buy. Right after the first wash, the collar folded over and never got their shape back. I'm sticking with the Stafford shirts. You can find T-shirts for less money, but I took a chance and it paid off! All my other T-shirts are going to Good Will. Fit great, hold their shape and color, tagless; they're worth a little extra. These are the best t-shirts you can possibly get for the money. I have these shirts in white and colors, and they hold color very well. They also keep their shape for years. I have purchased them several times and even the oldest, four years of duty wear, are still in great condition. Great uniform undershirt. The collar keeps its shape and doesn't fold over like many of the store brands. The extra length keeps it from riding up under your uniform, which leads to having to duck into the men's room to readjust. Also, the shorter sleeves won't stick out under a short sleeve uniform shirt. A little pricier than the store brands but worth it. Short (30" inseam), Regular (32" inseam) and Long (34" inseam).